Nice mod thanks for this. Wouldn't have made it to late game without it. I have updated to 0.4.18 and am getting an error [quote]/GUI.lua:329: attempt to call field 'add' (a nil value)[/quote]. I've went back to 0.4.16 and 0.4.14 and it persists. What can I do to fix this? Still on 12.5 as I don't want to update yet due to mods. Also, in 0.4.18, is there a solution to this ? issues resolved. I've had two zipped files in /mods. my bad. And now all of the mods I use have a perfect row of pretty buttons! I will have to post an updated screenshot soon. If you are in GOD mode and than go to a Train, you get stuck and lose all of your items You can move etc. but not have your Items in your Inventory anymore! LuziferSenpai wrote: I found a Bug. Completely missed that report Will try to remember to look into it. That would require to know which signal a train is waiting at, right now it only notices when a train stops at any signal and when it leaves from any signal. I got another mod in the works that might need to know the specific signal anyways, so i guess i can add it in at some time. Can you help me plz Choumiko ??? much appreciated ! They all have a ? before them, meaning they are optional dependencies. Much appreciated !thank you for the fast reply and fantastic mod support !!! I received the following error, when driving a whecile and I try control a train use of mod "c" menu. My character is kicked out from wheicle but my invetory is screwd, and the save file corrupted. (Loaded back last autosave.) Controlling a train use of map click on train function is not cause this error. Thanks! This is a great mod! 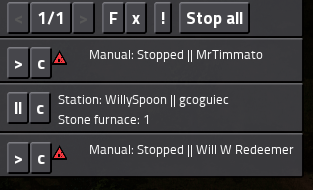 A bit a strange one, I'm not sure whether it's a Factorio bug or one from me, since when you already follow a train and then switch to another one it works fine. Until i figure it out you now only can follow a train when you're not in a vehicle. Shouldn't be too much of an issue for the time being I hope. I get a warning that a train has no fuel. But i cant find it. How can i tell whitch one ? is there a specific button for it ? Right now it should show an icon in the overview. You can then use the "C" button to jump to the train. That way you can zoom out and find out which one it is.